AUTO-CALIBRATION TO THE AMBIENT TEMPERATURE & HUMIDITY - Many moisture readers will display inaccurate results if the ambient temperature isn't the optimal 77℉, forcing you to adjust the tool manually. This one auto-calibrates itself - less work for you. 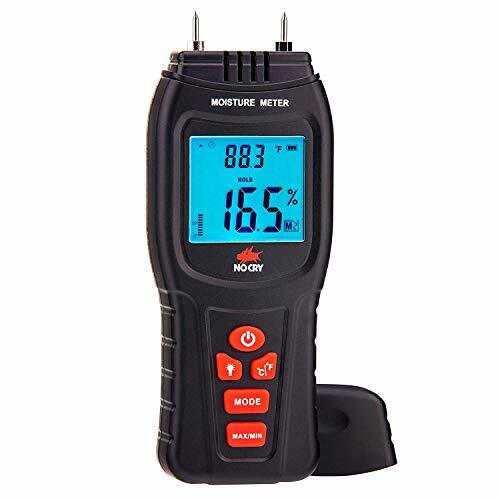 FUNCTIONAL LCD DISPLAY - With 2 brightness settings, it shows everything you need to know: the moisture level, the temperature in C˚ and F˚, the active measurement mode and setting, and - unlike most other moisture meters out there - even the remaining battery.